FLAVOR GUIDE: The flavors in our toothpaste are very strong and choosing the right flavor will change your brushing experience. The citrus flavors are preferred for kids and others looking for a more mild flavor. For people with sensitive gums, we recommend clove as the 100% pure clove essential oil will naturally reduce gum sensitivity and last for hours. All flavors are created only with 100% pure essential oils. A little goes a long way. We know you will absolutely LOVE this stuff! The same great remineralizing and all-natural formula as our jar toothpaste, but now it comes in the convenience of a tube. Read all our amazing reviews from our jar toothpaste. Our toothpaste actually remineralizes teeth with regular use and boosts your immune system with the benefits of 100% pure essential oils. It is a superior, all-natural formulation that is completely glycerin free. Most commercial toothpaste use glycerin, but recent studies show that glycerin prohibits tooth remineralization and even lowers enamel microhardness (see studies below). Discover Jade Bloom's remineralizing Toothpaste made with 100% pure essential oils; the last toothpaste you'll ever buy. Contact our support team today for a pre-paid return label. 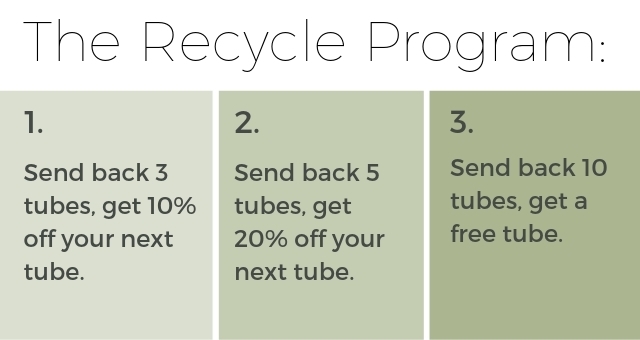 Once we receive your empty silicone tubes, we will email you a unique code with your savings. 8. Comes in 2-ounce silicone re-usable / washable tubes. A little goes a long long way. 3. Brush your teeth as normal for 2 minutes. Repeat each morning and night. Aloe Vera Gel -- Aloe vera has a lot to offer in the field of dentistry, a lot of studies is on the way to utilize the effective antimicrobial property of the miracle plant. Interest is gathering for the use of aloe vera in dentistry and this natural therapy is already proved its unlimited use in our field. Answer: Yes absolutely! Jade Bloom stands behind every product we sell with our No-Risk Guarantee that allows you to sample any of our products risk-free. If you are not completely satisfied with this toothpaste then not only can you return it for a full refund, but we will pay the shipping costs in both directions. Click here to read our No-Risk Guarantee. Answer: Yes we have 2 options. You can purchase it and sample it risk-free. If you are not fully satisfied then take advantage of our No-Risk Guarantee that provides you with a full refund and Jade Bloom covers the shipping costs in both directions. Also, Jade Bloom provides every U.S. household with the ability to sample $30.00 in free products by enrolling for free in Jade Bloom University to increase your knowledge in natural health and healing. Click here to learn more about Jade Bloom University. You won't find a higher quality, more effective remineralizing toothpaste anywhere! I bought the Tea Tree & Myrrh awhile back, but wanted to give it ample time before my review. At first my gums were extremely sensitive to it, but after a week, I fell in love. My teeth feel beyond clean and any sores I had are now long gone. The taste does take some getting use to, but once you're use to it, it's fine. Cant imagine going back to store bought. I was a bit skeptical in buying this. But i am so happy i did! I have been using the mouth wash already, and in combination, Oh My! I would highly recommend this tooth paste to everyone You will love it!! I have now used 3 containers of your wonderful toothpaste. My teeth feel clean and fresh. My checkups have been very good! PROS: With this toothpaste, my teeth look and feel clean and fresh. I like the original flavor, but may have to try the cinnamon next time as it sounds amazing. I like a strong flavor in my toothpaste. CONS: The toothpaste hardened in the tube before I could finish it. I tried mixing in a little hot water, but could not get it mixed well, so just tossed the toothpaste. I do still have the silicone tube, but I would likely just buy the jar and use it from there if I decide to give it another try. NOTE: I am the only one who uses this at my house. If you have more people using it, it would likely stay usable until finished. I bought this toothpaste last year and at first thought the silicone tube it came in was a great idea. However, as the toothpaste aged, the tube became harder and harder to squeeze and eventually I gave up. Still planning on transferring the toothpaste to a glass jar if it hasn't dried out completely. I do want to say that the toothpaste itself is great! I love the original flavor so I got the orange for my kiddos and was displeased to find that the oil separates from the paste quite badly. However, I reached out to customer support and am thoroughly pleased with their efforts to make right on my purchase. A great product overall (aside from the orange issue), and incredible customer service. Thanks Jade Bloom! I was ready to try an alternative to standard toothpaste. I was pleasantly surprised how much I liked this product. The silicone tube was sometimes challenging, but not a major deterrent to using it. I love Tea Tree and Myrrh. I ordered the tea tree tooth paste and at first my gums were a bit sensitive to it but now they're fine. I'm really liking this now. It leaves my mouth feeling very clean. Well I bought one of these and received a free one. Unfortunately, as the product was open for a while I had use more pressure when squeezing and the top shot off! So I ended up cutting the tube open and putting the rest of the tube into a nearly empty jar of JB toothpaste I had. That works, but completely defeats the purpose of the tube! I also prefer the ingredients and consistency of the jar version. I've still got an unopened tube and have purchased 3 jars of toothpaste while it sits. Guess that says it all! COMPANY RESPONSE - February 5, 2019 10:30 AM - Hello Energetic1, thank you for your review and we're very sorry to hear that the silicone tube is difficult to use with our toothpaste. This is a result to a much harder formulation of our tube toothpaste that we have recently resolved. Please contact our customer support team to receive a free exchange of our newer softer formula that we think you will like. Of course, our jar toothpaste is also amazing and we welcome continued use of that product if you prefer. I love this toothpaste! I think that it works great and really whitens. The only problem is the packaging. I have had 3 tubes now and have had problems with the lids cracking or popping off. The tooth paste dries up really quickly afterwards even when i put it in a ziplock bag. Love the clove and the original. Not to sure about this. I bought this and loved it when I tried it. But then I went back to finish the one I had in the jar. Then the one in the tube has gotten too thick to get it to come out. I've tried everything. Next is to cut the tube and see if I can use it that way. I think it must need to be used real fast or it must set up or something. I will go back to the jar I guess. I recieved the protect for free with purchase and bought the tea tree/ myrhh and wintergreen. Protect smells like big red and tastes great, not to hot. Wintergreen is my favorite tastes and smells like lifesavers. The tea tree and myrrh is not great tasting but I mixed it with my protect and it's better. My teeth feel so clean after. I love JB's toothpastes. This one is much more expensive than the jar but it's totally easier to squeeze and works just as well. I've been using this in my oral care and I love it. Good stuff. Im about 3/4 through the tube, the product is awesome and I can see and feel the difference, but the product needs quite a bit of kneading before use because it separates, other than that I like it a lot!! It has a great taste and does well. Difficult to dispense tho. Flavor is very good - milder than the Original. It also dispenses better. The paste is smoother than the Original which is very dry and cakey. We all love the toothpaste but new tube lid has come off on several tubes and will not go back on. We will be ordering in the jar until something changes with way this packaged. I love this toothpaste! It Remineralizing and taste great! I like this toothpaste but the lid is always popping off when I squeeze the tube. Other then that it's a great product! I bought the Original First taste was a shock. Very earthy. Now I really like it. My mouth feels fresher and my teeth feel cleaner. I couldn't believe this toothpaste. My teeth were hurting and I received my clove toothpaste and started using it right away and my teeth stopped hurting. My twin sister got the lemon and had to quit using it as her gums were to sensitive and they were bleeding. She started using my clove toothpaste and has had no problem. Yep ended up buying more clove toothpaste. Best toothpaste I've ever bought. My dental hygienist asked me what I was doing to make my teeth look so good. As she looks at teeth 40 hrs a week, I consider that a great compliment! Thanks, Jade Bloom. The consistency, while different from commercial toothpaste, is better than that of other brands of natural toothpaste I have used. I purchased the Wintergreen and the flavor is very subtle. I am anxious to see how the toothpaste performs over time, but I’m very pleased initially. This is a great toothpaste, cleans and refreshes, I have tried other brands, they were ok, I will continue to use Jade Blooms Toothpaste very pleased! I LOVE this toothpaste! I have been going thru chemo for breast cancer. It causes a sore mouth. The tea tree oil and myrr blend helped instantly! What a wonderful solution! I have had no sore mouth symptoms since I started using this toothpaste! The only issue is the tube broke so I’m trying to find a solution to easily use the rest of the tube. Disappointed. I was looking forward to trying the toothpaste, but it left sores in my mouth. Like it burned my mouth. COMPANY RESPONSE - September 29, 2018 - Penny, we're very sorry to hear that you developed sores from using our Toothpaste. We suggest you try a different flavor as the most likely cause for the irritation comes from the particular essential oils in the flavor you are using. We have 12 different flavors to choose from and different essential oils will most likely solve this issue for you. Please contact our support team to receive a free replacement or a full refund. I received my first tube for free. It took me several days to get used to the flavor. Now I love it. I just ordered one for my 15yo daughter and the tea tree/myrrh for myself. I have gingivitis so hoping it helps. I so very much wanted to love this toothpaste! I received the original flavor for free. I am very pleased with the texture and the flavor is what I expected as I am acquainted with the protect blend. However, my gums are not happy with it. If I use if for more than a couple days, my gums feel burned and irritated. I do not think this would be a problem with all the flavors, just perhaps any with hot oils, but I am not willing to risk it due to the cost of the tube. I had a little trouble initially getting the toothpaste out of the tube, but not for long. I love love love the new toothpaste in the tube smells and taste great. I will order more. Terrible taste. Will have to try another flavor. The opening in the tube, too small; have to squeeze very hard to get paste come out. I didn't think I would love this but I do. If you can get over the fact that it doesn't foam up like regular toothpaste and that it doesn't have a very strong it does wonders for your teeth! My teeth feel so clean and my gums seem healthier! Takes a while to get used to the texture. Just knowing that it’s good for my teeth helps and I’m glad that they put it in a tube! Best toothpaste EVER hands down! I am in love with this toothpaste. I'm not picky, I can stand homemade toothpastes and natural toothpastes that aren't conventional, I actually love the JB toothpaste in a jar. However, this natural toothpaste has totally spoiled me and I fear I will never be able to use any other natural toothpaste ever again! This toothpaste has a wonderful consistency that doesn't instantly turn to liquid/oil in your mouth, it glides on smooth and stays smooth. It coasts your teeth and gums beautifully and a little goes a long way, I don't use nearly as much as shown in product video. I love the ingredients, they're so good for your teeth and lack all the harmful 'usual suspects.' For anyone new to trying this kind of toothpaste, do not wet your toothbrush. Put the toothpaste on a clean dry toothbrush and brush without water. Of course, use water to rinse out your mouth when done. Hooked for life! Now I have to try other flavors as I've been using the original Protect.... I love it but I want to try more. I think I'll go with the Tea Tree & Myrrh and then Cinnamon for my next orders. I love this toothpaste! It does the job and you have no mess. Teeth feel clean and polished and you have a wonderful fresh mouth after use. I will be using this from now on and am going to make my kids use it too! I love it in the tube so much better than in the little pot!! Much easier to use, taste is amazing, and teeth feel great! I liked the toothpaste. Made my teeth feel cleane. But I got a sore on my gum. I stopped using it. I think I will try the one with clove in it. I love this new toothpaste. So much easier to use! I bought the original. Can't wait to try other flavors. I looove this toothpaste. I love the silicone container it comes in, and I love the essential oil of choice. I love everything about it. Will have a review after i've used it for 3 months. Thanks again. This toothpaste is amazing the clove flavor is hot but I love the flavor. I really enjoy their toothpaste. I started with their protect in the jar. I tried their Tea tree/myrrh blend in the new silicone tube. I like the tube and the fact you can reuse it once the toothpaste is gone! This is the best tooth paste I've ever used. I will never go back to store tooth paste. This leaves your whole feeling clean. When I wake in the morning, my mouth still feels clean. It's amazing! This is a great addition to your natural self care. I've always had cavities and sensitivity, since using this I have not gotten any new ones and my pain has decreased significantly. Tried this toothpaste and the way it makes your teeth feel so smooth and clean is just the best. We tried Lemon first and I think it needs a bit more lemon flavor. It is very hard to get out of the tube and ours is especially dry and crumbly inside. My kids love it, and it works great! I love the flavor of this though it might sound a little strange. I do find I have to scrub pretty good to get a clean tooth feeling, and while I love this squeeze tube with other products, it's a little difficult with the toothpaste as it seems to require quite a bit of squeezing to get it out. I do plan on trying out some other flavors. This does make my gums feel much better and it seems to help with tooth sensitivity as well. First off I want to say that I love both of these items. I read a review about the toothpaste causing sores and wondered if they used the mouthwash too. I was using both twice a day and had the same problem. I decided to stop using the mouthwash for a few days and my mouth cleared up. Now I only use the mouthwash once a day and everything seems to be fine. Both of the items work Great!! My mouth feels clean and my teeth are actually getting a little whiter. I had two root canals last fall and was having a hard time with them healing. This toothpaste and mouthwash has really helped. Proof is in the X-rays! I bought two different favors and love it! Will be using this forever. I always have bleeding at my gum line and soreness but it is totally gone after two weeks of use. I bought the citrus or orange flavor and the original... they are hard to get out of the tube but I remove cap and swipe instead! Love it! My husband and I started to use this toothpaste (original formula) for the last two weeks. We absolutely love this product. Yes, a bit hard to squeeze out of the tube but your teeth feel so clean. The ingredients such as coconut oil and the essential oils are a nice boost to the immune system with out putting those conventional chemicals in your mouth. Just purchased the spearmint to try a different flavor. We will continue to use! I tried the Clove. Clove is a hot oil and is very very strong in this toothpaste. In fact so strong it burns my mouth. I’m going to try adding a carrier oil ( coconut oil)) to try to cut the burning. I will try another flavor next time. I have been using this for two weeks. I have the tangerine. I want to love this toothpaste. It leaves my teeth and whole mouth feeling fresh and clean. It has really whitened my teeth as well. My problem is that its leaving my gums sore and causing blisters. Its also very hard to squeeze out and the EO that is used in this puddles all throughout the tube. Like its not mixed well enough. Im not sure if there is too much oil in this or what the problem is. My husband is using it and also has gotten a sore in his mouth as well. Its almost like its eating away my gums or something. :( I really want to like this but im afraid i may have to stop using it as it may be causing more damage than good. Jade Bloom is just getting more and more innovative with their healthy alternatives to traditional products, that over time hurt us. I love this toothpaste. They work hard to make the switch-over to a healthier lifestyle a little easier. This toothpaste is awesome. I thought I needed Fluoride in my toothpaste to prevent cavities. I’m not thinking that is the case anymore, thanks to Jade Bloom. I like the idea of this toothpaste in the tube but the lemon is not for me. It is very hard to get out of the tube and I'm having some joint discomfort right now so I am not really able to use it. Also, the flavor is ok, but I had thought it would be a bit more robust. It does not leave my mouth feeling refreshed. It may work well for cleaning the teeth but I would not buy this flavor again. I order two so far... The original (which I love) and I recently ordered the clove for my daughter. I tried the clove also... It is very strong flavor and smell. I like clove but the first time I used it I though Yuck! Lol however, I got used to it and my daughter likes it because it numbs her whole mouth. Her teeth are bad and it normally hurts her to brush so the numbing factor is good for her! This is definitely a different brushing experience for us but we like it! I was so excited to try this toothpaste! I've been using the toothpaste in the jar for almost a year. I have highly sensitive teeth so I wasn't sure it would be a good fit for me. I knew that I'd know in three days. I started using it and I've never looked back! I love this tube! A little harder to squeeze than I would have thought but oh so worth it! I bought Cinnamon for my husband and Lemon for me...perfection! Thank you for coming through again Jade Bloom!!! Love this toothpaste. Leaves your mouth feeling cleaner than ever before. Being on pre-order it took a little longer to receive, but definitely exceeded my expectations. It doesn't foam like commercial toothpastes but the taste is pleasant and benefits of essential oils (teatree and myrrh) are incomparable. I really like this toothpaste. I’ve been using it for 3 weeks. My daughter uses the lemon but I LOVE the cinnamon! It’s hot but my mouth & tongue feel clean after using it. I bought another tube for a friend who has demineralization on her teeth. I’ll report her results in a few months. I have been using this for almost two weeks. I ordered the original and like the flavor. This is not like your typical toothpaste, so it may take a little bit of getting use to. I also ordered the mouthwash with it. The toothpaste really cleans your teeth. I don't seem to have that buildup on my teeth as the day goes by. I really do like the combination of toothpaste and mouthwash. I highly recommend giving it a try. I ordered the Clove and it leaves my mouth feeling tingly clean!! I LOVE IT!!!! I've been using DoTerra OnGuard toothpaste which is wonderful as well but I think I like the Jade Bloom better!!! i ordered the lemon flavor disappointed it has a strange artificial taste. i love lemon too. i don't feel my teeth are clean after using it. i would not recommend this toothpaste. COMPANY RESPONSE - June 14, 2018 9:30 AM - Jenny, we’re very sorry to hear you weren’t happy with the lemon flavor of our toothpaste. We recommend you try one of the other 11 different flavors as it can dramatically change your brushing experience and we’re confident you’ll find a flavor you will love. Please contact our customer support and they’ll be happy to help you return your tube for a full refund or a flavor exchange. I like the consistency of it and the taste is ok. I haven't used it long enough to know if it is whitening my teeth yet. But my mouth does feel clean . Feels like you just left the dentists chair! I used to get the cinnamon paste in the jar and it was spicy but bearable. This tube paste is so so hot that i can barely brush my teeth. I can literally see the cinnamon oil pooling in the tube. My bathroom smelks like big red gum. (Which isnt a terrible thing). Im going to keep going in hopes that it calms down but ill probably go for a different flavor next time. Its burning my mouth. This is great toothpaste! The lemon is similar to lemon meringue pie (just not as sweet obviously!). This left my teeth silky smooth and very clean feeling. I follow with the mouth wash, it is very minty and my mouth stays fresh for a long time! I ordered the original and also clove and I like them both a lot; my teeth feel really clean!! Clove is a bit stronger than the original. But I alternate and like them both! I love the taste of the clove and it does take away all the stains and gives me a white smile with no plaque on my teeth. Very clean feel and taste and my teeth do not get that sensitive feeling after. I had tongue cancer surgery on May 7, 2018, I was allergic to the RX Mouthwash from the Doctor then my order from Jade came in with the toothpaste and mouthwash and I love it. It will burn the lips if you are not careful, but I love the way it makes my mouth feel and my teeth are whiter. I would recommend either / both to anyone. I have only used it 1 time so far......I got the tangerine and I like the taste ! I am hoping that it works on sensitive teeth like the protect does because I like having a variety of flavors to choose from ! It cleans well, didn't do well on keeping my teeth white. I found after using a week, my teeth were less white. I'm going back to using the organc toothpaste I was using. I do like the tube, though, good idea. I received clove and tea tree-myrrh. I love both of them! The first few times the taste was strange on the tea tree-myrrh but now it’s fine. The clove is great when I’ve irritated my gums. I must say this toothpaste takes some getting use to. The taste is what bothers me but I must say my teeth have not felt this clean in forever. I will definitely keep using this product. It took a while for my shipment to get to me but was so worth the wait since the pre-order. My teeth feel so clean even after drinking my coffee and still by the end of dinner. A little does go a long way, pea size amount. I got clove flavor, it's just a tad strong but bearable for me. I love it!! Before I started this toothpaste I had 4 cavities because my teeth were not remineralizing. I am now down to 2. Amazing..word of caution on the cinnamon flavor..the new formula is way more intense than the kind that came in the jar. I liked it better than this tube. I have a blister on my lip, not sure if it is from the toothpaste but it is like burn blister and it burns my lips. I will switch to the original next order. I love the toothpaste in a jar AND this version. This is actually much easier to apply to the toothbrush and also has a smoother consistency. It tastes and works well, leaves my mouth feeling very clean and fresh. No harmful chemicals or foaming agents! The ingredients used are truly one-of-kind. I’ll just have to switch it up!! Plenty of flavors too! I ordered the cinnamon flavored toothpaste. I love the texture, not grainy and the squeeze tube is a huge improvement over the jar. The cinnamon flavor, which I've ordered in the jar form is much hotter. I can barely use a drop without having to rinse my mouth from the cinnamon oil which means I'm not getting the full benefit of the toothpaste when I'm rinsing it out almost as soon as I've stared brushing. I even tried squeezing the tube to move the toothpaste around hoping the oil may have just separated a bit, but no, that didn't help. It took me a few days to adjust to the texture but after I did, I wouldn't use any other toothpaste. I ordered the lemon and I love the taste. I'm looking forward to finishing the 6 month challenge! Will definitely continue using and buy again. Love how clean it makes my mouth feel. I love the new toothpaste in a tube. Honestly, I was not a fan of the toothpaste in the jar, but the new tube is great. It leaves teeth feeling super clean! For the first time as I can remember my mouth feels clean after brushing not covered in a chemical force field. I love the peppermint flavor. It is strong but refreshing!! Love this toothpaste! I'm in awe, finally the perfect, glycerin free paste! Different than anything I am used to! I had tried the cinnamon in the jar toothpaste, and wasn’t too fond of it....only because it was harder to get out of the jar than I would like! I switched to the wintergreen flavor. I like the tube and the flavor much better! I just wish it left more of the minty flavor after. But only using 2 weeks, I have noticed a difference. Awesome! Keeps my teeth clean and feeling fresh all day long. Totally recommend it!! I ordered the spearmint flavor of this toothpaste. I won't lie, if you are switching to this product from a normal drug store toothpaste, it's not the easiest transition, but it's worth it in the end. It is difficult to get used to a paste that isn't foamy in your mouth. The texture is very different. I'm sticking with spearmint to get that minty flavor we are all used to. Love it now! The one thing I'm not crazy about is my bottle can be very difficult to squeeze the paste out of. You have to squeeze really hard. Still more convenient and sanitary than a jar though. I reviewed this just after receiving my tube of cinnamon toothpaste so this is a add on to that review. After using it for about 2 weeks I find it way to hot to continue. It has caused my lips to be very chapped and it's way too hot to brush long enough to be effective in cleaning. I've requested that it be replaced with a tube of Spearmint paste to use. This is the best natural eo toothpaste I have tried. I love the clove taste plus it's great for your oral health. I purchased the original flavor toothpaste. Although I don't particularly care for the taste, this toothpaste leaves my teeth looking and feeling super clean and my mouth feeling fresh! This is very user-friendly while it has the toothpaste in it, and the tubes are reusable for so many things! I never thought I’d get so excited over toothpaste! While my family does own & operate this company, Jade Bloom has offered toothpaste for quite some time & I didn’t use it. Honestly, I didn’t like that it wasn’t in a tube (Because of our commitment to Mother Earth) & the formula wasn’t my favorite either. Every issue I had has been addressed. The packaging is the most sustainable option I’ve seen on the market & the formula is the most natural I’ve seen. Most importantly though, the taste and feel during and after use is better than anything I’ve ever used. We got Cinnamon, what’s your favorite flavor? Received my tube of cinnamon toothpaste yesterday and I must say it has a VERY strong fragrance to it. So strong I could smell it when I opened the mailbox! Used it this AM and love the taste....surprisingly strong, so much so that it is hot to the taste. Made my lips and gums a little numb and my mouth felt hot for a few minutes. The paste is very thick and I was afraid that the tube would burst squeezing it out but seems ok. There is so much cinnamon in it that you can smell it when you enter the bathroom, right through the tube. Cinnamon is my favorite scent/spice so I'm liking it very much . I’m a customer. I’ll keep buying it. Kind of has to muscle it out of the tube but I was concerned about squeezing to hard and shooting it everywhere. Major kudos on putting it on the toothbrush. So much easier than warming up the jar and scooping it out. Loved the spearmint, kind of wished there was a “fruity” note but I could get over that. Loved that it didn’t make my mouth feel oily/greasy. I don’t like that about the jar. Teeth felt super clean. And even several minutes later I still feel the fresh mouth feeling. I have tried many natural toothpastes before, and this is by far my favorite. The flavor and smell of the original blend is amazing, a minty cinnamon taste. Your mouth tingles and feels fresh and clean with truly good breath after wards, the squeeze container is so much better than the jar, I recommend everyone tries this stuff!